Wee Willard crossed over the two pound mark, so all the Trimbles are going in for surgery tomorrow. That means they'll be ready to leave our nest soon! We've had some nibbles, but not all the Trimbles are officially spoken for. So, if you think you need a Trimble Tabby or two, please step forward now and send an email to kittywrangler(at)gmail(dot)com. Tell us a little bit about yourself and the kind of home you could offer a kitten. And if you're not in the market, but know of someone fabulous who might be, please send them our way! Oh noes - that was quick!! Am guessing Monroe is taken? I have lots of room for Trimbles... a trio of Trimbles, in fact. That room, however, is in Michigan. Ordinarily, I'm quite happy to be here (just not when itty-bitties are available). Just tweeted this post. Hopefully it will make its way to the right pair of eyes. Wish I could take all three, but I live in Wales! I'll bet they'll get great new homes though, they're gorgeous! I would loooooove to have one come live with me, but unfortunately I'm in Portland :-/. Hoping they find great homes though! As always, I am regretting geography while loving the kittens. They'll be gone in a wink, I'm sure. Who could resist those sweet faces? Wow, they grew up so fast! Of course, I say that every time....but it always feels that way. I know the perfect homes are out there waiting for them. Who wouldn't want a no-longer-quite-so-wee Trimble? I blinked, darnit! 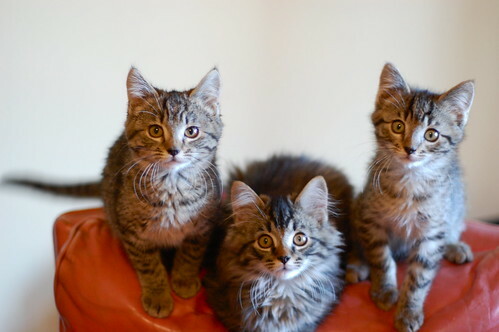 I am jealous of anyone who adopts one of the Treasured Trimble Tabbies. Ohh! They are so,so cute. Purring they find good forever homes. What could be better than a tabby Trimble under the tree? More than one of course. Some families are going to be so very lucky this Christmas. Jealous from Dallas. I very much want a Trimble Tabby Twosome, especially having recently lost my 19-year-old girl to a stroke. However, I am in Wisconsin, not Washington. Drat, I thought we were going to get to nibble on them in a literal fashion. Om nom nom. Oh, the lucky folks who get a Trimble. I'm sorry to say goodbye to them so soon. I really fell hard for them. The best present the Trimbles can get is a furever home. I wish them well and for you to have a quiet holiday. I do so hope these darling Trimbles get a home for Christmas (and for life, of course). They are so adorable. I also hope someone takes two or maybe all three. I can't believe how quickly they've grown. I am crushing so hard on Wee Willard. It's a good thing I live in Texas or I would adopt him right now. He is a very special little boy. Oh, such dear sweet earnest little babies!! I love them and their black licorice noses!! Cod if I was closer and had an empty nest I'd take all 3! *squeesigh* they are gorgeous and can't wait to see them all puff out! Happy 2012 thekittybittycommittee and all of your readers!